Charges for general merchandise are based upon actual shipping costs published by the carrier chosen. We prefer to ship via FedEx as we have a daily pickup service (Monday through Friday), but we can normally accommodate requests for other carriers you may prefer. Please note that if you request USPS shipping, your order may be delayed until the next business day as our USPS pick-up is before noon Pacific time. Products are insured during transit for an amount covering the price and shipping costs. To estimate the shipping cost of your order, add the item(s) you are interested in, click VIEW OR EDIT CART and then the ADD INFO link next to the shipping field. Supply the requested details and then click ESTIMATE SHIPPING. If delivery times are shown, please take weekends and late in the day order submissions into account, as any delivery times generated will be estimated based on our ability to ship the item on that same day. You will select your final shipping method and costs during the secure checkout process. For larger palletized items, we ship via motor freight. Our shipping volume provides us excellent rates for cross-country palletized shipments which are generally less than $350 per pallet. We can usually provide you a shipping quote for palletized shipments within a few hours if one is not shown during checkout. Multiple pallets are even less per pallet. When requesting a shipping quote, please include your town and postal code and be sure to let us know if delivery will be made to a business or residence and whether or not a dock or forklift is available for unloading. For large items or orders containing multiple items where the shipping costs are not available, please contact our customer care department at 805-648-3300 for assistance. Local pick-up is an option as well. Will calls can be made at our warehouse in Ventura, CA. Our address is 3820 N. Ventura Avenue | Ventura, CA 93001..
Returns are accepted for exchange (or refund when no replacement is available) if the equipment does not operate as specified. Defective merchandise must be reported to us within 30 days of receipt. AS-IS, "parts only" items, media, and manuals are not returnable. Non-defective merchandise may be returned within 30 days but will be subject to a 30% restocking fee. A Returned Merchandise Authorization (RMA) number is required prior to returning equipment for any reason and should be clearly marked on the return box. The buyer is responsible for all transportation and shipping costs both to and from Recycled Goods. Recycled Goods is not liable for mistakes or misprints on the web site or in any other publication. All returns require an RMA number for processing. To obtain an RMA# for your shipment, please contact us at customercare@recycledgoods.com or (805) 648-3300 as soon as you recognize there is an issue. Once your return is approved, we will provide your RMA# and return instructions. RMA numbers expire 10 days after the date issued. Returned items must be received within that time frame, or the RMA will be cancelled. Replacements will be sent free of charge via common carrier once defect is confirmed by our technician(s). Returned items must be received in good physical condition with all included parts/accessories or your RMA may be denied. We suggest appropriate insurance on all returned parcels. Any item returned without an RMA number will be refused and/or returned to you at your expense. Items are typically insurable for OBVIOUS PHYSICAL DAMAGE only. This means that upon receipt, and before the driver leaves, your purchase should be inspected for any signs of visible damage. If the item appears to have been damaged during transport, please be sure the party signing for the delivery makes a note of that damage (in specific detail) on the delivery receipt before giving it back to the driver. Save all packing materials (pallet, carton, cushioning, peanuts, bubble wrap, etc…) as well as the damaged item for carrier inspection. Notify us ASAP (805)648-3300. Please have your order # handy for expedited service. We will file a claim on your behalf or give you the required contact information for filing yourself if allowed by the carrier. All insurance claims are settled at the sole discretion of the carrier. Recycled Goods will not be responsible for any reimbursement on denied and/or partial claims. Upon receipt of your purchase, please test for advertised function as soon as possible. Depending on the condition code of the item at the time of sale, you may be able to return a defective item for exchange (or credit if no replacement is available). Any item returned as “defective” which tests “no problem found” upon receipt will be subject to a NON-DEFECTIVE restock fee (30%). All returns are for exchange of like part only unless no replacement is available, in which case a refund of the purchase price (less any shipping/handling charges) will be given. All refunds will be provided via the same means through which original payment was made. On the rare occasion that a shipping error has occurred and you receive the incorrect part, please contact us immediately for instructions at customercare@recycledgoods.com or (805)648- 3300. When you have located the item you want to purchase, you may use the QUICK VIEW feature or click on the main item link to then add into your shopping cart. At this time you may do any of the following: PROCEED TO CHECKOUT, PAYPAL CHECKOUT, CONTINUE SHOPPING, or VIEW/EDIT YOUR CART. Once your shopping cart contains all the items you wish to purchase, please use whichever checkout method you prefer and then enter your login information or create a new account. You may checkout as a guest, but you won't have access to online order statuses and order history. Please fill out all pertinent information and any special comments you would like to add before submitting to place your order. Currently, we are unable to process international web orders with the exception of those originated in Canada. If you are located outside of the US or Canada, you may submit a request for the item(s) you wish to purchase by e-mail to customercare@recycledgoods.com and we will send you purchase instructions. Please include the item sku(s) as well as your complete shipping address and we'll respond as soon as possible with details. We accept PayPal or Bank Wire Transfer in payment for such orders. We accept PayPal, VISA, MasterCard, Discover, and AMEX. Credit cards are accepted via the PayPal service, but you don't need a PayPal account to checkout. Here's a screenshot of the window that will appear when using the "PayPal" payment method. 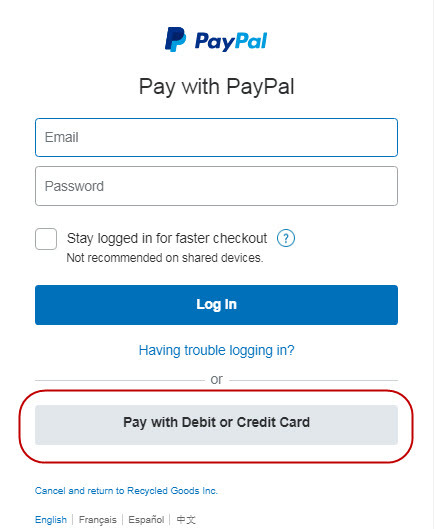 If you want to use a credit card to pay without having a PayPal account, please choose the bottom button circled below. Bank wire transfer may be required for high value orders. We will process your order and call you if we have any questions or concerns. We are only authorized to ship to the billing address for the credit card provided or the confirmed PayPal address. If you would like to request an exception, please contact us at customercare@recycledgoods.com or 805-648-3300. Please note that all orders are subject to verification and may require additional written approval, especially in the case of high value or international purchases. If satisfactory verification cannot be obtained, payment by bank wire transfer may be required. Our products will go on sale from time to time. Promotional pricing is subject to change. Recycled Goods is not liable for mistakes or misprints on the web site or in any other publication. If you have a discount or coupon code, please enter that prior to completing your order. We may not be able to adjust your order once it is in process. If you create a user account with Recycled Goods, you will be able to view Orders, Returns and Messages as well as create wish lists for future shopping needs. Log into your account using the SIGN IN link at the top right of any page. Click the ACCOUNT SETTINGS link to may any needed changes. Directions to Recycled Goods, Inc. Recycled Goods is located approximately 70 miles north of Downtown Los Angeles, as well as the LAX Los Angeles International Airport. On the 101 (Ventura) Freeway traveling north take the Highway 33 North approximately 3 miles to the Shell Road exit. Turn left on Shell Road and travel about 1/4 mile to N. Ventura Avenue. Turn Left on Ventura Avenue and look for our building about 1/2 north on Ventura Avenue on the right side of the road. We are located at 3820 N. Ventura Avenue at the corner of a private oilfield road named Hartman Turnoff. Recycled Goods is located about 300 miles south of San Francisco. On the 101 (Ventura) Freeway traveling south take the Highway 33 North approximately 3 miles to the Shell Road exit. Turn left on Shell Road and travel about 1/4 mile to N. Ventura Avenue. Turn Left (north) on Ventura Avenue and look for our building just ahead on the right side of the road. We are located at 3820 N. Ventura Avenue at the corner of a private oilfield road named Hartman Turnoff. Please park just inside the gate on the north side of the building and enter the breezeway and follow the signs to the office. Computer and equipment drop offs please call (805) 648-3300 x 0 to let us know you're coming so we can have someone available to assist you.